Oh, I love dots! I know I've seen this type of dotticure before, but I can't think where. If someone knows, please let me know, and I'll give credit where it's due. Lord knows, I'm not creative enough to come up with this stuff on my own. I knew the moment I saw Orly Sapphire Silk (on sale!) I had to have it. It is a teal blue, but without much green in it. Like most Orlys, the formula was impeccable, and this blue is now one of my favorites. I added dots, dripping down the nail, in China Glaze Aquadelic. This polish is perfect for dotting - spreads nicely, doesn't get gunky on the dotting tool too quickly, and is nice and opaque. Hmm. It kinda looks brown in this pix, but the next layer of dots is actually grey - China Glaze Concrete Catwalk. I wasn't sure it was going to show up well against the teal, but with a little help from the Aquadelic, I think it did okay. To add a little interest, I then used Nina Ultra Pro Molten Copper, a lovely duochrome, over everything. It looks a little different depending on what was under it. This made the mani for me! I love dots - anyone got some links to new and different ways to wear them? This gorgeous, sweet lilac is Revlon Lily. I find myself really into these pale purple colors this year - not that purple ever goes out of style! Typical good Revlon application, two coats, no topcoat. Doesn't it look so innocent? Like a blushing bride? How about now? This is with Kleancolor Bridal Shower. I don't know if it's a dupe for OPI Pirouette My Whistle because I don't own it, but from pix, it looks similar. It's a sheer white base with lots of small silver glitter and some larger silver hex glitter. Have you ever worn polish that made you feel so delicate and pretty? If I were renewing my vows, I would seriously consider this mani for the occasion. 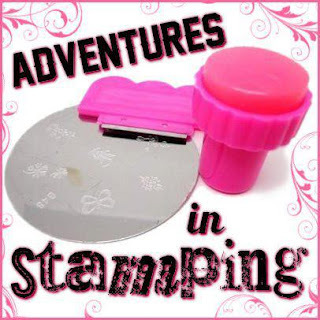 Hey, stamping fans! After so much holo fun this week, I had to use another holo in my Sunday Stamping Challenge, which was to incorporate red and black into the stamp. I'm not sure there are many prettier holos than a red one, so that's where I started - with a fave. Jade Vermehelo Surreal! I am a sucker for geometric designs, but they still don't love me back. I picked a square stamp in black... and then, I accidentally used the stamp next to it for the ring finger. It's supposed to be circles, but it's just a hot mess! I love how the holo looks from under a stamp. It has such depth, almost like it's moving. Right hand. Circles look a little clearer here. What do you think about mixing geometric patterns? To finish off this holo week, I want to share with you some other random pretties. This is Ozotic 513. The thumb is 1 coat over black, the others are 3 coats alone. I do seem to have a thing for purple holos, don't I? I don't think I realized how many I had until I was swatching this week! And this is Ozotic 531, a multichrome holo, or a 'mish-mash'. Copper/pink beauty. These two are part of the discontinued line, but you can still find a few floating around, I think. I'm sure there will be some on e-bay. The Brazilians have a lot of beautiful holos. The Specialista No Olympio collection is stunning, and so are the holos from UP colors and Ludurana. There are swatches many places for those, but I wanted to share a couple that I have and enjoy. This is UP colors Multi-Magenta. I find that most holos labeled 'magenta' are more pink, but this one at least has some magenta flashes in the holo. This is Ludurana Notavel. Every holo collection has a silver. I didn't think I needed them all, but apparently I have collected my fair share. I picked this one up at a sale on Llarowe, I think. This is a polish I haven't seen much of, but it's starting to crop up on nail blogs. Missha has a cosmetic line, and also makes some nice BB creams, if you're into that. I picked this polish up on their site with a couple of other polishes and the BB cream. It's the mysterious and beautifully named, "JBR01". Isn't that romantic? Cute, heart-shaped bottle. I told you it was romantic. :) And it's brown. I love brown! I've never seen OPI My Private Jet holo version in person, but I've heard tell that this is close to it. And, finally, a few from Glitter Gal, one of the first holo lines I heard about. I picked up these on sale at Llarowe. They are the SMALLEST polish bottles out there, so be aware that you are likely paying more per ounce for this polish than a fancy steak dinner. GG Fuchsia. Really? Looks like a baby pink to me. GG Copper. I really liked this color, but it doesn't read copper to me. Maybe a rose gold. GG Marine Blue. I am such a fan of blue polish, and blue holo polish has me jibbering like an idiot. This is so pretty. I don't know if it's worth the money over say, a Jade blue holo, though. I remember when I first discovered holos and this next one was the Holy Grail of them all. You couldn't beg, borrow, or steal a bottle of Lizard Belly. It's a dark teal base with a beautiful rainbow. There are others I like better, but this is still a unique color and a very nice polish. Well, I hope I haven't bored you to tears. I'd love to hear your recommendations for holos you love. First up is Orange Marmalade, an orange scattered holo. Though I love orange, this one wasn't one of my faves. I know jellies sometimes take a lot of coats, but I get bored after about 3, and start rushing it, which makes a mess. So I think I stopped after 3 coats here, and obviously still have VNL. And not really enough holo payoff. Mint Jelly had a similar story - lots of VNL, not much holo. I do like this color, though. Maybe I'll layer it with Cult Nails I Got Distracted next time. Blueberry Jam actually has way more holo than I captured here. It's a linear, and pretty, but the sun went away and I just couldn't get it back before I took off the polish. Grape Jelly was my favorite of all. Pretty color, nice strong linear holo, a little VNL at 2 coats, but not bad, and buildable in 3, I'm sure. I will say that even though not all the jelly polishes had enough holo payoff for me, they were all nicely made. All of them applied smoothly. The really sheer ones might make nice jelly sandwiches, or some other application, but were just a tad too sheer for my liking. Your mileage may vary. I also have a few polishes from Darling Diva Polish to show you. Dreamy is a holo topcoat, but I had to try it on its own, and I loved it. It shows up as a white holo. So cool. Event Horizon is a charcoal grey-black holo with a nice linear rainbow. And last, but not least, is Dangerous Driver. DDP has another polish called Ringer, which is a dupe for Fantasy Fire/Clarins 230. Dangerous Driver is the holo version of Ringer. It is gorgeous. I've paired it here with some rhinestones from the Cult Nails collection. 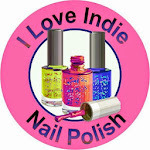 So, are you ready to try some Indie holo polishes now? You're not going to find most of these polish colors/combos anywhere else!